There's great excitement as we build up to our game this weekend. Not only is it a local derby but its a game where the two top goal-scorers in the Championship, Stephen Dobbie and Lawrence Shankland go head to head as Ayr United visit Dumfries. 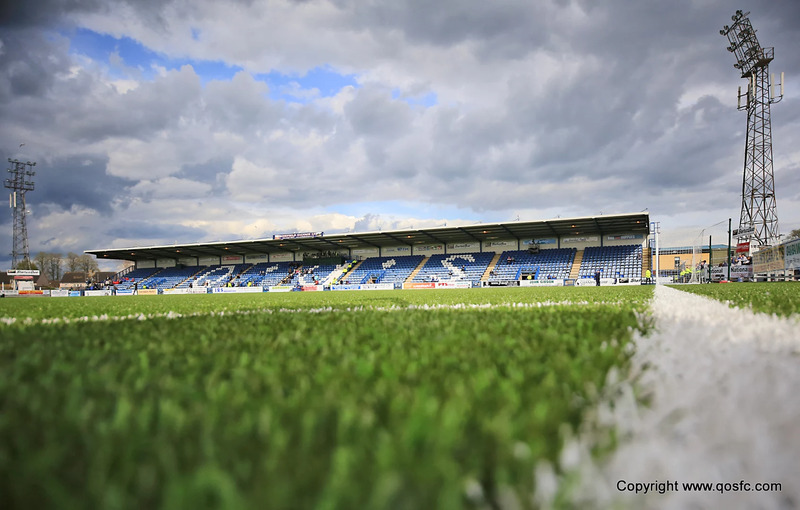 With an Irn Bru Cup tie against Crusaders and another home game in the Championship against Ross County to follow, it's the first of three consecutive games at Palmerston for us but hopefully a game that will provide entertainment. With the visitors relegated and spending time in League One our last meeting was in April 2017 when Stephen Dobbie grabbed a double to give us a two - nil win at Somerset Park. Queens boss, Gary Naysmith has been looking back on our terrific performance and victory over Falkirk last week as well as looking ahead to the visit of the Championship leaders. "I'm going to start by giving the players a massive pat on the back. I said after the game during my post-match interviews at Falkirk that it was the most complete performance of my time in charge and I said the same thing to the boys in the dressing room. To go away from home in this division and win by three goals take some doing. I was told afterwards that we'd had 23 attempts on goal, that's an amazing figure and speaks volumes for the creativity last weekend. You're probably fed up of me heaping praise on Stephen Dobbie but he was terrific again last weekend. I wouldn't swap him and Lyndon for any other pairing in the Championship. However, wins are made from clean sheets and I was delighted with the way we kept Falkirk at bay. We defend as a unit and we have set standards last weekend that I want to try and sustain every week. When we went three - nil ahead and the points were secured I was urging the players to protect that clean sheet. The work rate was everything I expect it to be and, again, it's what I want every time they play for the football club. We are a small squad and we have had to fill the bench with young boys who don't have experience at this level but they'll be learning every time they travel with the first team. They may well be needed in the coming weeks and they need to be ready. It was great to see both Dean Watson and Robbie Ivison get on against Falkirk. This weekend we welcome a newly promoted Ayr United who have made a splendid start to the season and sit at the top of the table. They've clearly got the confidence that comes with promotion as champions and they are showing that they can certainly compete at this level. So we will need to be at our best again to get something from the match. We are still without Callum Fordyce and Darren Brownlie who have long term injuries but everyone else is ok and really looking forward to the game". It should be a very entertaining game and as we are expecting a decent travelling support it will hopefully be a great atmosphere within the stadium. Those visiting from Ayr should note that sections six to nine within the BDS Digital (East) Stand have been set aside for them. They should enter the ground via turnstiles three and four. The away stand catering outlet will be available for use of Ayr Utd supporters. Catering is also available in the Arena café for both sets of supporters, where a full menu is available before kick-off. Entry is by ticket only. The away ticket office will be open for away supporters from around 12 noon and is situated adjacent to the BDS Digital Stand turnstiles. In addition, supporters who choose to park in the Arena car park have access to a ticket office at that location. Please note that the away ticket office is a CASH ONLY office. Should spectators wish to pay by card then they should purchase their tickets at the Arena ticket office. With a sizeable away support expected. Spectators should arrive in plenty of time to ensure that they purchase their ticket and gain entry to the stadium for the kick off. Turnstiles open for admission at 2pm. Ayr Utd supporters may wish to purchase tickets when dropped off at ground and before travelling across town for refreshments. This would save unnecessary queueing on return to the ground. Supporters should also note that the Electric Fields Music Festival is taking place at Drumlanrig Castle at Thornhill this weekend, therefore the A76 is expected to be far busier than normal. There will be on-street parking restrictions, therefore it is suggested that buses/mini-buses drop off their passengers in Terregles St/King Street and thereafter park on College Mains road just off the roundabout with the A76 on the town bypass (adjacent to Curry's/PC World, as the other side at Aldi is the access road to the ambulance depot and is extremely busy). Pick up should be the same location. QOS have adopted a robust search policy for spectators entering the ground to ensure that ground rules and regulations are strictly adhered to, especially in relation to pyrotechnic devices and controlled containers. Palmerston Park is a non-smoking venue, this includes e-cigarettes and other such devices. Stewards are empowered to eject spectators who disobey these rules. All spectators are requested to abide by our unacceptable behaviour policy. No persons will be admitted to the ground who are deemed to be under the influence of alcohol. The match which has a 3pm kick off is sponsored by Jas P Wilson with Homer Burgess our silver ball sponsor for the game. It will be a special day for Adam Copeland who will lead the teams onto the field as our mascot. Although the game has a 3pm start, the Queen of the South Saturday Club will be taking place in the Arena from half past 12. Two hours of coaching, fun and lunch for Primary School kids before they head over to watch the first team in action. Great value at £10 per child (£8 for Junior Blue season ticket holders). And there is no need to pre-book just register on arrival.